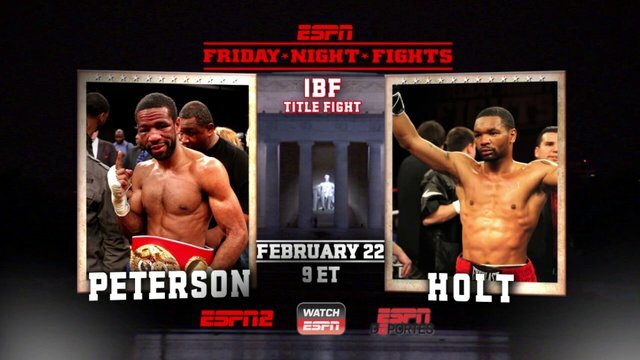 Lamont Peterson, looking to restore some luster to a tainted rep, defended his IBF junior welterweight crown, stopping Kendall Holt in round eight of a clash in DC, which ran on ESPN's "Friday Night Fights." Holt went down in the fourth, and then again in round six. Both times, he made it to the next round. Not so in round eight; ref Tony Weeks gave Holt a chance to answer, but the Jersey fighter didn't, and he stopped it. The time of the TKO was 1:42. Peterson after the fight said he ate a clean shot and knew he couldn't be hurt. He said he would need to look at the tape to truly assess himself but admitted he "did a good job." He said he caught a second wind, and looked to stop Holt. Next? The Golden Boy fighter said he wants the WBA belt back, which is held by Danny Garcia. The WBA yanked the strap from peterson after his positive. Holt after said he should have mixed it up a little bit more. He said mentally, physically and emotionally he came in good. Next? He said he will re-evaluate. Layoffs have hurt him, he said. He will think about hanging it up if he can't stay busier. Holt started cracking early but lost steam once DC native Peterson got untracked. In front of a vocal crowd at the DC Armory, fighting for a pittance basically, as the fight went to purse bid, and promoter Gary Shaw "won" it with a bid of $50,000, Peterson did restore his rep some. If we can assume he is clean, then he looked like a darn good fighter without any sort of aid. Right hands worked for Peterson. He ended things with the loser trapped on the ropes, eating. Peterson hadn't fought since Dec. 10, 2011, when he beat Amir Khan. He was then busted for using testosterone, which he maintained was prescribed by a doc for legit medical reasons. The IBF let him keep his belt, though a May 2012 rematch with Khan was scrapped because of the dirty sample.